This, combined with the fact that they don't have any predators, allows them to stay in the same area year-round, nibbling on the grasses, herbs and sedges they can find. When snow comes, they simply paw it away and keep nibbling. It's a lifestyle that has allowed Svalbard reindeer to persist over the millennia, long enough for them to adapt physiologically and evolve into a separate subspecies. But over the last few decades, the warming climate has brought more rain and less snow in some winters. These rain-on-snow (ROS) events can cause ice to form on the ground. The ice coats the reindeer's preferred food and causes them to starve— a potential catastrophe. In other words, will climate change make Svalbard's reindeer go extinct? "In the past, some rare icing events have been shown to cause population crashes," the researchers said. "An intuitive expectation would be to predict more population crashes and hence a greater extinction risk with continued warming." During that time, reindeer calves were captured and marked each spring and re-sighted in August. Using this information and a biological model called an Integrated Population Model, or IPM, the researchers created what amounts to a detailed picture of the Svalbard reindeer population —with annual population sizes, survival and reproduction rates for six female age classes. They also used historical data on the yearly amount of ROS since 1962 to obtain what they called an icing, or "winter harshness" proxy, which allowed them to look at how ROS affects population dynamics. Equipped with these tools, the researchers were able to make projections of how the reindeer population they studied would change given different future ROS scenarios. When the researchers ran the models to see what would happen, they found that the reindeer population behaved in a counterintuitive way under future scenarios where conditions were harsher, meaning when the ROS frequency increased. "If ROS conditions remain the same as observed in the past, the probability that the population goes extinct is actually much higher than under the likely future scenario of very high ROS frequencies," said Marlène Gamelon, a CBD researcher who was also the co-first author of the paper with Hansen. The key, the researchers found, was that extremely harsh winters with ROS events could only cause a population crash if animal density was high, because that was when competition for food was great. Even under these conditions, only the most vulnerable animals, the youngest and the oldest, die. Females, weakened by the lack of food, were less likely to have calves. If one bad winter with lots of icing followed almost right after the first, the researchers found it essentially had no effect on the population. The small, robust population hadn't aged that much and was not at risk of starvation. "The interactions between climate effects, density and age structure explain why our study population did not crash in recent icy winters," the researchers said. "In other words, internal population restructuring modifies and buffers the effects from climate change." Steve Albon, from the James Hutton Institute, initiated the Anglo-Norwegian reindeer study south of Longyearbyen 25 years ago. "When we started our studies, rapid climate warming of the magnitude seen in recent decades was unimaginable," he said. 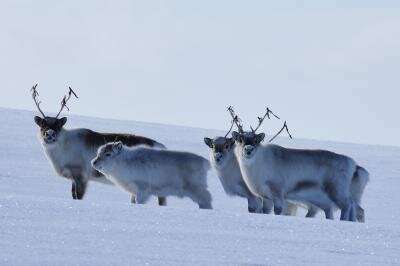 "But without following hundreds of individual reindeer throughout their long lives we would never have acquired the data to understand their responses to the changing environment." And so, for this reindeer population, anyway, a series of icy winters one right after the other may not necessarily be such a bad thing. "This study provides the first evidence that fluctuations in population size of long-lived species are actually dampened when extreme climate events become frequent," the researchers said.